Sausage Tree camp is the epitome of bush chic offering a civilized approach to a true bush experience with lavish attention to detail. This exclusive safari camp, voted number one on the BBC Holiday Programme's 'Ten Best Luxury Destinations', specializes in the very best game viewing with the highest international standards in luxury and service. Sausage Tree Camp is set in the most stunning location on the banks of the Zambezi River in the heart of the Lower Zambezi National Parks best game viewing area. The camp overlooks an expanse of narrow channels and low set reed islands teeming with game, with the magnificent Zambezi escarpment as the backdrop. 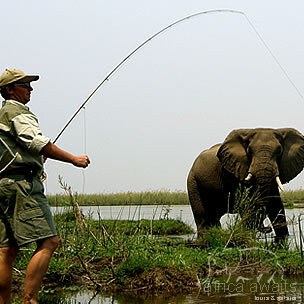 Sausage Tree Camp offers the widest range of safari activities including day and night game drives, walks, canoe trips, boat cruises and fishing. With personalized guiding, our guests decide exactly what activity they would like to take and when. Elephant, hippo and buffalo are seen in camp daily. Guests also have an extremely high chance of seeing lion, leopard, wild dogs, hyena, waterbuck, zebra, impala, bushbuck and kudu during their stay. Sausage Tree Camp is the epitome of bush chic, set in a stunning location along the Zambezi River at the heart of the Lower Zambezi National Park. The pristine location and Sausage Tree Camp offer all the game, all the luxury without all the people! Sleeping only 16 guests, Sausage Tree Camp offers a civilized approach to a true bush experience with lavish attention to detail. The central dining and bar area is fronted by an enormous teak deck overlooking the Zambezi River and low set reed islands teeming with game. The large swimming pool is idyllically situated under shading Mahogany trees. Accommodation is in luxurious white Bedouin style tents, completely rebuilt in 2008 to the highest of standards. Tents are generously spaced along the Zambezi River bank allowing the elephants to amble in between. Local materials create a minimalist style in which the teak furniture, including sumptuous four-poster beds, contrasts with pure white fabrics and flowing mosquito nets. Nearly hidden from one another, and shaded by mature Sausage and Mahogany trees, the tents are cool, private sanctuaries to return to for an afternoon siesta or good nights rest. Each of the five 'Signature Tents' has a unique open-air en-suite bathroom, a distinct Sausage Tree Camp trademark, and sliding teak doors opening onto private decks with Zambezi River views. The two enormous 'Honeymoon Suites' each boast indoor and outdoor bathrooms, dining area, bar and a king size bed overlooking the private pool set into the expansive teak deck. 'Kigelia House' (new for 2009) is the perfect choice for small groups or families, with two en-suite bedrooms separated by an open plan living area leading onto the private deck and pool. 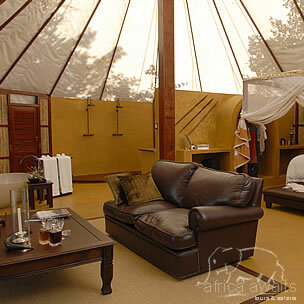 Each tent has its own personal Muchinda (butler) to attend to your every whim. All tents have 24 hour power and plentiful hot and cold treated water. Sausage Tree Camp's African inspired fusion cuisine will certainly be a highlight of your stay. Made from the freshest ingredients, the tastes and presentation will astound you. But the experience of dining at Sausage Tree Camp goes far beyond the food itself. 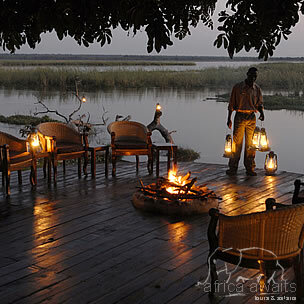 Dinners to the sounds of the African evening by candle light in the open air dining tent, by star light on the deck, by moonlight on an island in the Zambezi, by campfire light deep in the bush, or by lantern light in the privacy of your own deck; Lunches on a sandbank in the Zambezi River, the water lapping at your feet; Sundowners watching the sun set over the Zambezi escarpment from the deck or overlooking the river or open plains. Each meal will bring surprises and memories to cherish. Should you have any special dietary requirements, please let us know when you make your reservation. We take pride in fulfilling your every desire, but a little preplanning may be necessary on our part. With your holiday, safari or business trip from in to Sausage Tree camp in Zambia.